Some social media users turned to Twitter to share images and videos showing smoke coming out of the medieval cathedral in Paris. 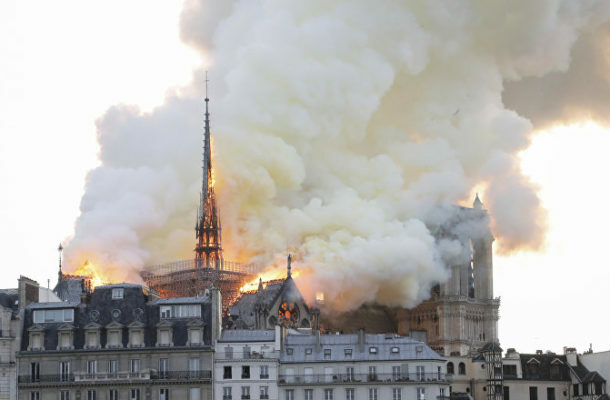 A fire started at the Notre Dame Cathedral in the centre of the French capital on Monday at around 6:50 pm local time, according to the fire department. Reacting to the reports about the blaze engulfing the Notre Dame, French President Emmanuel Macron said that the 'terrible fire' forced him to cancel a planned address to the nation that was set to take place on Monday evening. 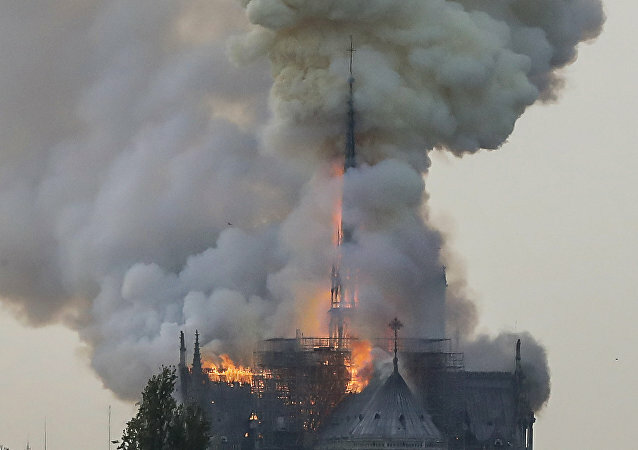 READ MORE: WATCH LIVE as Paris' Legendary Notre Dame Cathedral Burns Numerous photos and videos uploaded by social media users show clouds of smoke coming out of the building. — Solveig Godeluck (@Solwii) 15 апреля 2019 г. — David Almacy (@almacy) 15 апреля 2019 г. — Liam Taylor (@LiamMTaylor) 15 апреля 2019 г. The site close to the 850-year-old cathedral has been cleared, according to a city hall spokesperson. The French Prosecutor's office has opened a criminal investigation into the fire that engulfed Notre Dame Cathedral on Monday, local media reported citing the French Interior Ministry. 400 firefighters have been deployed to put out the massive fire which engulfed the iconic Notre Dame Cathedral in Paris on Monday, Parisien reported citing the French Interior Ministry. Soutien et admiration pour les forces de #secours et de #sécurité totalement mobilisées pour éteindre, dans des conditions très difficiles, l'incendie de #NotreDame #Paris pic.twitter.com/PDOUamoNfe— Ministère de l'Intérieur (@Place_Beauvau) 15 апреля 2019 г. The roof of the historic cathedral has completely collapsed, according to Sputnik correspondent. A raging fire has engulfed the structural frame of the Notre Dame Cathedral, the French BFMTV broadcaster reported on Monday. Notre-Dame de Paris en proie aux flammes. Émotion de toute une nation. Pensée pour tous les catholiques et pour tous les Français. Comme tous nos compatriotes, je suis triste ce soir de voir brûler cette part de nous.— Emmanuel Macron (@EmmanuelMacron) 15 апреля 2019 г. "Notre-Dame consumed by flames. Emotion of a whole nation," Macron tweeted, noting further that he was "sad to see a part of us burn this evening." He also expressed solidarity with "all Catholics and all French people." Paris police stated on Monday that it is still unclear what caused the fire and if anyone died as a result of the incident in the French capital. 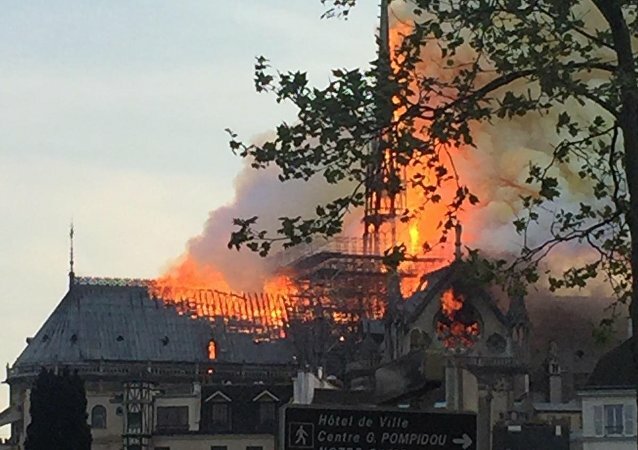 The spire just collapsed #NotreDame #fire pic.twitter.com/v50rHQChN0— Meraphetamine (@MyMeraphetamine) 15 апреля 2019 г. 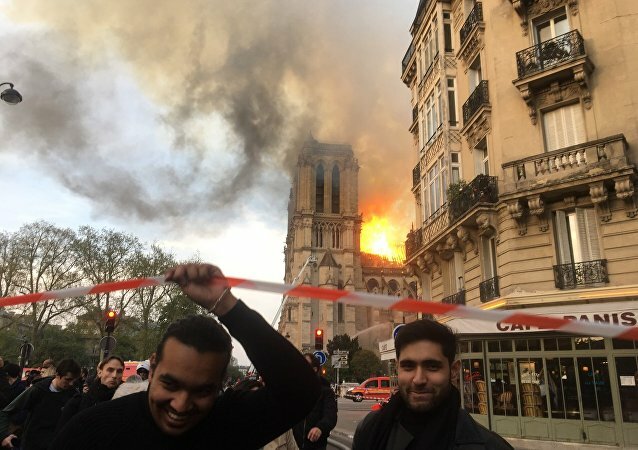 21:11 15.04.2019The priceless 7th century Paris landmark went up in flames on Monday afternoon, with firefighters seemingly unable to prevent the fire from spreading. So horrible to watch the massive fire at Notre Dame Cathedral in Paris. Perhaps flying water tankers could be used to put it out. Must act quickly!— Donald J. Trump (@realDonaldTrump) 15 апреля 2019 г.